The UK government continues to refine its policies toward public access to journal articles based on publicly funded research. After a scathing rebuke from the Business, Skills and Innovation Committee, the Finch Group, responsible for the initial report that has driven much of UK policy, met last November to reaffirm their approach. Recently, David Willetts, the UK Minister for Universities and Science issued a letter to Dame Finch, thanking her committee for their work. This letter offers perhaps an unintended glimpse at the deep questions that remain about the economic feasibility of the UK policy, and what appears to be a request for some economic sleight of hand to help make ends meet. The Research Councils United Kingdom (RCUK) open access (OA) policy, announced in July 2012, was a bold and trailblazing move. The UK took a leadership position, seeking to set the tone for a worldwide move away from publishing research via the subscription business model and driving it toward an author-pays Gold OA model. The economic benefits of the policy were dependent on whether other nations and funding agencies adopted similar polices. The assumption was that it would cost the UK more over the short term, but if other nations adopted the same policy and the majority of articles worldwide were published in a Gold OA manner, the UK could start to drop journal subscriptions and achieve overall cost savings. However, it has become clear that other governments are choosing to go in a different direction, favoring Green OA policies. The United States, for example, has chosen to require public access to author manuscripts after a suitable embargo period, rather than following the UK’s call for immediate availability. The UK has thus been left out on a limb with a policy that’s at odds with much of the world. UK open access initiatives as currently formulated will undoubtedly lead to a significant de facto increase in costs for the UK. Instead of paying twice, once to fund the research and again to pay subscription fees to access that research, the public will find itself, in effect, paying thrice—once to fund the research, once to fund open access global publication and dissemination of the results of the research, and a third and final time to pay subscription fees to access critical research conducted throughout the rest of the world which does not operate under the same funding regime. This failure to recognize global economic realities runs deep in the UK’s policy. Despite repeated calls for data and analysis to back up claims of economic benefit, such studies have yet to take place. In fact, Willetts’ letter states that the UK government is just now, a year and a half after announcing the policy, getting around to commissioning a study on whether it would be feasible to do a cost benefit analysis that backs up the claims upon which it is based. It seems unfathomable that tens of millions of pounds would be committed yearly to a policy that poses a threat to disrupt an entire industry without doing a comprehensive analysis to show whether it was a good idea in the first place. The government therefore “looks to the publishing industry to develop innovative and sustainable solutions”. He suggests this should involve a “meaningful proportion of an institution’s total [article charges] with a publisher” being “offset against total subscription payments with that publisher” on a sliding scale up to a set limit. In other words, when a university pays a Gold OA fee to publish an article, Willetts wants that fee deducted from what the university pays to access other articles. The connections here are tenuous at best, and betray a deep misunderstanding of the scholarly publishing industry. Scholarly publishing is a service industry. Researchers need certain services performed to both verify and disseminate the work they produce (see Michael Clarke’s post for a primer and Kent Anderson’s extensive list of the services publishers provide). Traditionally, researchers have not been asked to pay directly for these services. Instead, authors offer the publication rights to the article in question, and the publisher uses those rights to recoup the cost of the services performed (to be fair, page and color charges have also been used to cover costs of print publication, but these are increasingly anachronistic and unlikely to last much longer). Gold OA turns this into a much more straightforward exchange, a cash payment offered for services rendered. The work done on each article is thus paid for, either collectively by the readers or individually by the author. Seen in this light, what Willetts is asking for here is the equivalent of the “double dipping” his administration and the Finch Report have decried. 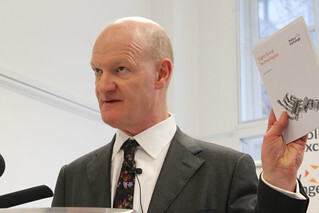 In this case, rather than a publisher charging twice for access to the same article, Willetts asks that the same payment be applied twice to overall expenses, once for the author charge on an OA article and a second time to pay for access to every other article published in the journal. Why should a payment for services on one article entitle one to a discount in paying for services rendered on other unrelated articles? It’s not a viable business model, even more so because Gold OA article charges are largely subsidized by other revenue streams including subscriptions. If one removes such subsidies, many journals will need to drastically increase their article charge rates in order to break even. Authors paying a Gold OA article charge are already receiving a discount from many journals in this manner. Why is a second discount on every other article from other authors warranted? This logically inconsistent approach is not in the best interests of sustainable publishing. Costs must be paid, and hoping that a payment that covers one set of costs can also magically cover a second set of costs amounts to wishful thinking. IOP has just announced an experimental pilot with the Austrian Science Foundation where author fees will be offset by subscription prices. There are no free lunches being offered here though. The pilot locks in a customer for three years, and the total amount paid remains the same regardless of OA uptake. Even if this pilot is successful and other publishers are talked into similar double dipping arrangements, it means that promises of cost savings and relief for library budgets will not happen, and instead the status quo level of spending will be maintained. If the RCUK’s OA policy is going to work, it needs to pay for itself. Notions that enormous savings will be reaped have been thwarted by the different policy directions chosen by the rest of the world and by the economic realities of publishing. Even if the UK can talk publishers into allowing double dipping, it would increasingly seem that their OA policy is a break-even move at best, and more likely will require additional spending, both for access to articles funded by other countries and to cover the inevitable overheads of the complex administrative processes being proposed. A comprehensive economic analysis of the situation would clarify such issues and help the UK set policies that are more likely to succeed. Hopefully the UK government will one day decide that such a study is feasible, and actually make it happen. 60 Thoughts on "The UK Government Looks to Double Dip to Pay For its Open Access Policy"
The UK took a leadership position, seeking to set the tone for a worldwide move away from publishing research via the subscription business model and driving it toward an author-pays Gold OA model. It’s disappointing to see, once more, the common and completely misleading conflation of “author pays” and “Gold OA”. As established by numerous studies, the majority of Gold OA journals do not levy an APC. Even allowing that the larger-volume Gold journals more often do, the total proportion of published Gold OA articles for which an APC has been paid is 50%. So the phrase “author-pays Gold OA” literally ignores half of all Gold OA. Here’s why this is important: the UK government wants Gold OA, but doesn’t specifically want author-pays (and would likely prefer to avoid it). By contrast, the publishers that dominated the make-up of the Finch committee very explicitly do want author-pays. At the moment, I’m saying nothing about whether and to what degree that desire is reasonable, and to what extent the UK government should acquiesce to that desire. All I want to do is separate two quite different concepts (Gold OA and author-pays) so that we can discuss this from a correct foundation. If this confusion exists, it may be because both the Finch Report and the RCUK’s stated policy focus heavily on the payment of Author Processing Charges (APC’s). The term “APC” appears on 51 of the Finch Report’s 140 pages, and on 10 of the RCUK’s policy’s 13 pages. Extensive plans are offered for things like block grants and distribution of funds to researcher for APCs. If as you state the goal is to focus instead on different OA business models, then their plans are much less complete than are necessary. I see little about handling the volume of papers that will be needed nor about driving the creation and sustenance of the enormous number of new journals or converted journals using these alternative models to meet the needs of researchers in fields where they don’t exist. If you can direct me to the RCUK’s detailed economic plans for doing so, I would appreciate it. Hi, David. Yes, of course it’s true that an realistic Gold-focussed OA policy must take APCs into account. They exist, and they’re important! The problem comes when there is a conflation of Gold and author-pays with the effect that people believe (or more likely just assume) that they’re the same thing. Unfortunately, it’s clearly in the interests of some publishers that this confusion should exist. For these publishers, the desired outcomes are either that people think “Gold OA always means author pays, and I don’t like that so let’s keep subscriptions”; or “Gold OA always means author pays, so we must always pay when we publish OA”. Since both those attitudes are predicated on a falsehood it’s impossible for people to formulate proper perspectives. Which I fear is probably the outcome that what some (not all!) publishers want. Semantically there is no conflation in the quotation, Mike. “Author pays” is clearly modifying “gold OA” indicating that it is a subset. David is generally very careful in that regard, as I try to be. Others are less so but in fact in many contexts gold OA does mean APC OA, with no evil intent. I know analyses have been done looking at the raw numbers of no-APC OA journals and the percent they make up of the total number of OA journals. Has anyone looked in terms of the percentage of total OA papers such journals publish? Does PLOS ONE skew things heavily toward APC journals? Also, what about a subject area analysis? Are there say, lots of no-APC journals available in library science but few in hematopoeisis for example? Such information would be useful. I know analyses have been done looking at the raw numbers of no-APC OA journals and the percent they make up of the total number of OA journals. Has anyone looked in terms of the percentage of total OA papers such journals publish? That’s a survey though, and only asks people about their “last open access publication.” I’d be curious to see a more comprehensive analysis, might give a more accurate picture of the landscape. Per a Nature News Feature last year, Outsell in 2011 estimated an average open-access journal APC of $660 which “does not represent the real revenue collected per paper”; additional revenue comes via membership schemes and subsidies. Implications of ‘no-cost’ journals are fantastical. Thanks David, very helpful. Looking at the BMC paper, at least as of 2011, the majority of OA articles were published in journals that charge fees. Given the explosion in PLOS ONE and the continuing growth of OA, it would be interesting to know how those numbers have changed in the last few years. It would also be interesting to see those numbers cross correlated with the different disciplines. It could point out different fields where the no-APC model is more likely to succeed than others. You are welcome. I think it is clear and the APC funded articles (not necessarily journals) are growing faster than the articles funded by other means. For what it’s worth, I know of no broad/established/well regarded OA journals in ecology that is no-APC. All OA journals relevant for ecology are either full OA (e.g. Ecosphere, Ecology and Evolution, BMC ecology, Plos) or old established journals that have gone the hybrid route (either society run or under Elsevier/springer/wiley). I’m sure that by saying this I’m missing some journal, but either way, no-APC is extremely rare in my field and not a viable way to publish in reputable journals. I run the Journal of Political Ecology OA and we have no charges at all. Since 1994. it is both viable and reputable. This is social science, but the issues are exactly the same. Ecologists would have to step up and publish, run, recognise professionally, and support their own outlet, as had happened in other disciplines. Or take over one of the existing journals, as the AAA (anthropology) has just done. I’m definately not saying that it cannot be done (I don’t really know enought about publishing to say). My post was mainly a comment to the above statement that “…the total proportion of published Gold OA articles for which an APC has been paid is 50%..” and the following discussion on the extent of no-APC OA. I many ways no-APC OA is probably a great idea (both for prospective readers and authors), but the costs of publishing must still be covered in some way. Are there studies of how sustainable OA business models that do NOT rely on APCs are? And whether APCs are going to work as a model in fields outside the STEM disciplines? It’s all well and good to say that there are alternatives to the APC model, but if we can’t have much faith in their sustainability, what good are they as models? Some of your questions are answered in the following article. Universities and societies fund and publish most of the OA journals that are not funded by APCs but all sorts of other organizations publish journals including governments, foundations, hospitals and other nonprofits. Over 10,000 articles a year are published in the humanities and social sciences in OA journals indexed in Scopus the majority funded by means other than APCs. Many have been around for a decade or more. There are a lot of societies that make the digital versions of their journals freely available. This is an old list that has been updated with many more journals but I can’t find the newer version. Most of the journals published in Latin America are published (and funded) by universities and are paper journals that have always been freely exchanged among universities. Many have also made their digital versions freely available via platforms like SciELO and Redalyc. Thanks for the references, but saying that universities and societies are the sources of support for most OA journals in the arts and humanities doesn’t really answer the question about sustainability, does it? This just passes the buck to the further question: how long will such entities be willing to subsidize the full cost of such publishing? We know that universities supporting university presses do not seem willing, on average, to pay more than 10% of the operating costs of those presses. So, how long do you think there is going to be the will to pay 100% of the costs of publishing OA journals by such entities? Time will tell, of course, but my guess is that the answer is: not forever. See my earlier comments further up. We have been going since 1994 and the journal is growing hugely of late. Under the scenario of a university-hosted journal, or a cooperatively-run journal on wordpress or similar, ‘sustainability’ refers to availability editorial time (and willing referees), not cash and a business model . At the risk of being repetitive (and even boring) can I point to the examples of OECD’s and Open Editions’ Freemium OA models? Each deliver access to publications free of charge to everyone via a Read-only service and earn revenues by charging for access to premium editions. In OECD’s case, we have examples where funders choose to stump up APCs which allows us to move the freemium ‘wall’ and make some of the premium services free to all as well. Toby, are you talking about books or journals? We tried a freemium model for our series of monographs in Romance studies at Penn State, and it was not sustainable. Why do you suppose you were successful with the model while Penn State was not? If funding agencies like the RCUK, EU, ERC or FWF (Austrian Science Fund) offer payments for Hybrid OA (one might dispute whether it makes sense or not) and if the libraries in that country/region of the funding agencies pay for the same journals subscription, then a pilot like between Austria and IOP saves money for the libraries and therefore also for the country/region. Furthermore, the original version is OA (incl. CC BY). If other consortia going to follow, then a tipping point can be reached where it makes sense for the journal to switch to Gold OA. – Including publication costs in the research budgets so that researchers become more sensible for the price-service-relation. The alternatives you’re proposing are unclear, but they sound more elaborate, difficult to create and monitor, bureaucratic, risky, and expensive. will see, well will try our best … and if we get (as funders and reseachers) more value for public money I would risk the risk. By the way, bureaucratic! What could more bureaucratic as negotiating every year with hunderds of publishers for mostly intransparent deals, embargo periods, licences e.g.? That’s not bureaucracy, that’s commerce. If your new solution requires additional spending, so much so that you must ask publishers to count the payments for services on one paper to simultaneously be applied to payments for services on unrelated papers, perhaps that solution does not offer the efficiencies you are seeking. David, as I understand the Austrian solution, by definition it offers the publishers the same total revenue as continuing with subscription publishing, in exchange for doing exactly the same work. The only difference is that the world can make better use of the research. That looks like a net win — indeed, even a win-win in the long term, as the publishers in question will eventually be able to stop spending on maintainance for their paywall system, subscription marketing, etc. So I don’t understand what’s not to like. On the surface, it seems like a great deal, but there are enormous holes that will likely mean additional expenses and a lack of sustainability. Where to start? First, it adds another murky layer to journal finances. In an era where many are seeking transparency, this seems like an extension of the Big Deal, an amorphous amount of funds are demanded and the return offered is uncertain. What are you buying with this deal? Access? Publication of papers? How many? You won’t know until the year is over. Figure each institution will pay a different price under a confidentiality agreement as well. Second, if one thinks that the serials crisis has reached its limits, then is a deal that continues existing spending levels, presumably with yearly increases built in, is the way to go? Deals like this would seem to put a hard stop on the creation of new OA journals by existing publishers. If the amount you’re receiving is set in stone, why create a new OA journal? You can’t charge the institution extra for access because it’s freely accessible. Are institutions going to add on to the fees they pay just in case someone at the school might want to publish in the new journal? It would also seem to spell an end for fully OA publishers. Where Elsevier could do this deal because they are selling access to subscription journals, how would PLOS exist in such an environment? If schools are doing these deals and as you say, their spend is the same as it currently is, then where do the funds come from for fully OA publishers who are not privy to the same sorts of deals? That means additional spending, and the system grows more expensive. Why would I allow my researchers to publish in a PLOS journal for $3000 when I can do an OA publication in an Elsevier journal at no additional cost? These last two issues lead to stagnation and a lack of experimentation. How would such deals be allotted? Are they only offered to schools that are under funding mandates demanding OA or does everyone get such a deal? If only select schools get this double dipping deal, then the schools that don’t get the deal have to be double dipped upon by publishers. School A gets a deal, they get to double dip and one payment pays for both the articles they publish and the articles published by other researchers at other schools. School B gets no such deal. For publishers to maintain current levels of revenue, they can no longer reduce School B’s subscription rates to match OA uptake by School A. There are no funds coming in to pay separately for OA articles. So School B must be double dipped upon, with no reduction in subscription rates despite a rise in OA articles. Is that fair? Let’s say everyone gets one of these deals. With such a deal, there’s no reason you wouldn’t publish everything OA. Now that everything is OA, there’s no reason for a school that consumes but doesn’t produce to continue to pay. So they drop out. For publishers to maintain their same levels of revenue, that means the productive schools have to start paying more. Given that the consumer schools were paying from funds derived from tuition and student fees, rather than funding grants, this leaves the producer schools with a big bill to pay and no way to pay it, unless they either greatly raise their own tuition rates or the funding agencies come up with more money, likely pulling funds from research areas. That’s off the top of my head, I could likely dig deeper if necessary. Many good point, thanks. Food for thought. They are not buying back their own products, first of all. Academia did not make the brands of journals, does not run the complex systems that it takes to manage peer review and editorial systems, did not do any of the 71 other things publishers have to do to serve as what you dismissively call “intermediaries”, and do not court risk like publishers do. Do you know how much it costs to reject a paper? But those rejections send the paper to where it belongs, and where it has greater impact ultimately. They are valuable to academia, but they cost a lot. How do you know that the current system isn’t extremely efficient? You are always welcome to try to set up a more efficient objective review and endorsement system. If you can, then you should just compete the current system out of existence. That’s a better approach in my opinion than seeking to legislate it out of existence without a proven and better alternative in existence. I would welcome a fact — not an assertion, but an actual fact — showing that the current system is inefficient. Sure it did. The appeal of any journal’s brand is due to the decades of work academic editors, reviewers and authors have put into it. David, I thought you were opposed to economic analysis of proposed OA policies, on the grounds that the industry is too subtle and complex to make them feasible. No, I just want analyses to be accurate and reflect the real world. I doubt your standards are met by conventional cost benefit analyses. The US Government does these for all significant regulations, under guidance I helped write by the way. Have you looked at many? They are SWAGS done by economists and I am sure the UK’s will be no different. More importantly, however, the government typically skews them to support what they want to do, so it is imperative that the industry do it’s own. I see no motion in that direction. I suspect most publishers have, at least on some level, conducted their own internal analyses as part of their future planning. Asking private businesses are willing to publicly release internal data may be something of a non-starter, but asking for their input and guidance as such studies are done by governments might be helpful, at least in terms of understanding the various revenue streams and costs involved. Does that seem an outrageous request? These kind of internal analyses are microeconomic and as such they may be irrelevant to an industry cost benefit analysis. For example loss of profits or even income is not typically a cost while lower prices is a benefit. Loss of quality due to APC competition might be an indirect cost but it would be very hard to quantify. Job losses might be a cost depending on the approach taken, but that is usually done by industry. A pro-OA economist could make the forced transition to low cost APC gold look pretty good. I am also curious about the difference between being accurate and reflecting the real world? But in any case in economic modeling, which is what cost benefit analysis is, as in most modeling, accuracy is a relative term. So there is no such thing as being accurate, just more or less so. This is largely a function of cost. The more one reflects reality, the more accurate ones measures are likely to be. I would prefer studies that offer greater levels of accuracy, wouldn’t you? It depends on how much you want to pay. Most cost benefit analyses are pretty crude and given the lack of data plus their speculative nature there is no feasible way to make them otherwise. One can only refine guesses so far. I was just reminded of “The Austrian Experiment” on funding Gold APCs, which is outlined in slides 10 and 11 of this presentation by Falk Reckling. What are your thoughts on that? Took a quick glance. Is this any different than what’s being trialed with IOP (addressed above in the post)? no, that is the deal we were looking for ..
Another reading is that WIllets’ letter is a coded plea to publishers to recognise the significant margins they have been allowed to make over the years, and to move away from the traditional practice of double dipping. While I agree that Willetts is asking for a handout from publishers to cover the economic shortcomings of his policy, I don’t see the tie between historical publisher margins and “double dipping”. Asking for each individual article to be paid for, either by the author or the readers seems to me the definition of “single dipping”. Coming up with ever more clever ways to fund a model conceived and perfected in the paper era seems like a shell game to me. It keeps all eyes on the funding scheme and away from the archaic and inefficient methods employed by recipients of those funds. With digital technologies, it is no longer necessary to circumnavigate the economy to get scholarly publishing done. The initiator of this work and the consumer of this work are, for the most part, one and the same – institutions of higher education. The barriers to bringing all of this in-house that existed during the paper era no longer obtain. Higher education is under enormous pressure to reduce costs. Specifically, reducing the costs that are borne directly by or passed on to students. A good bit of that is seen as attributable to scholarly publishing and is starting to look like low-hanging fruit. Whether higher education can overcome its own inertia and muster the motivation to attempt such a sea change is another question but the opportunity and the means are there. I had thought library budgets (as a reasonable proxy for costs of scholarly publishing) were a small and declining percentage of university budgets, so how much fruit is there to be picked? Journal prices continue to rise 6-7% per annum while public funding for higher education is far from recovering to its pre-recession level. http://lj.libraryjournal.com/2013/04/publishing/the-winds-of-change-periodicals-price-survey-2013/ let alone keeping pace with rising costs. This kid of squeeze has helped drive tuition costs up at rates higher than health care and, with it, student debt. The prospect that this bubble will burst is very real. OA of any stripe will alleviate this situation by shifting costs, at least for STEM fields. The humanities and social sciences are probably out of luck. The Association of Research Libraries (http://chronicle.com/article/Research-Libraries-Increase/134862/) seems to think that research libraries are spending more on digital materials and less on other things, including personnel. The shell games go on but the reality that journals and other scholarly publications cost much more than they need to continues to be ignored by those in the business. Will the customer, under these new and worsening economic pressures, take note and countermeasures? As noted above, serials prices (on a per-serial basis) have been falling as tuitions have risen. Overall serials expenditures are rising, but libraries are taking up a diminishing percentage of university budgets. If anything, the growth in university budgets is coming to some degree at the expense of the libraries, not the other way around. Public funding for higher education is not all that is available for higher education. In the US, the costs of attending university have increased 550% since the 1980s, while library budgets have fallen as a percentage of that. The net effect? Library budgets in dollars are increasing, but slowly. And the real cause of the increase isn’t price increases (actual per-serial prices have fallen the past decade, see http://scholarlykitchen.sspnet.org/2013/01/08/have-journal-prices-really-increased-in-the-digital-age/) but the number of titles being published. There are more scientists publishing more science. This is not a shell game, but a result of governmental emphases on education, scientific research, advanced degrees, and so forth. You are using a pejorative against publishers and blaming us for being part of a system that is under strain because the supply side is being over-emphasized while the demand-side is being under-appreciated. The funding imbalances that result are what is making us turn on each other. That’s too bad. We need to get to the root cause of all this, and that root cause is not publisher misbehavior or library inadequacy, but rather a systemic imbalance of funding. An for the record at my state university public funding has dropped from around 70% of the budget to about 31% or 32% in that same period. I think that is pretty typical for most state universities and the major reason why tuition is so high. Technically they are about embargo based green OA policies, especially the US policy, but much of the discussion is relevant to all OA policies. Sorry, but did you just say that publishers have been generous up to now in allowing academics to publish, free of charge? That’s not the way most people see it. Most people would say that publishers have been exploiting academics by not paying them for their work, then selling it on for high prices (without having added very much other than typesetting). I’m not sure anyone said anything along those lines. There’s no generosity involved, it’s a business transaction. But you’re making the same common mistake referred to in the post above, thinking that the publishing business is a product business rather than a service business. To repeat, academics need certain publishing services (see http://scholarlykitchen.sspnet.org/2010/01/04/why-hasnt-scientific-publishing-been-disrupted-already/ and http://scholarlykitchen.sspnet.org/2013/10/22/updated-73-things-publishers-do-2013-edition/ for more on these services). Like hiring a plumber or a laboratory technician, one has to pay for those services. One can do this directly, paying a publisher a set amount through an article processing charge. Traditionally though, the author has paid for the services by granting the publisher the rights to distribute the article, and the costs for the services are then passed along to readers. Publishers pay academics for their work through the services rendered. David, many thanks for quoting the LSE Impact of Social Sciences post. The editor had asked me to condense this article from last year (http://www.triple-c.at/index.php/tripleC/article/view/520) down to 1000 words for their blog. However, with Willetts’ latest announcement, it ended up being a bit more timely than I’d anticipated!